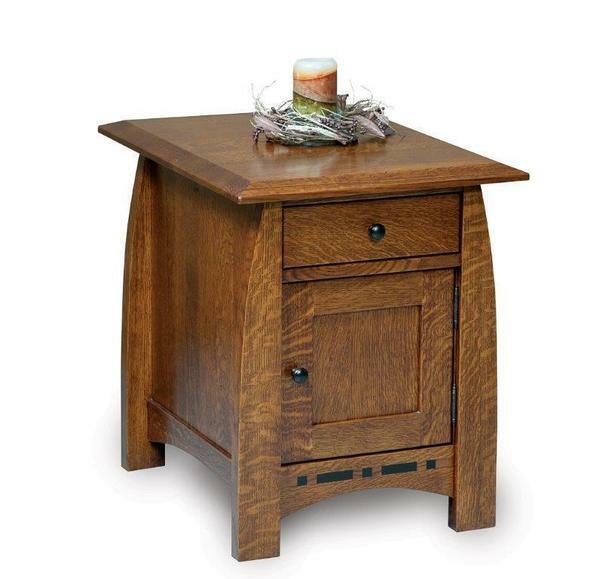 Our mission-style Amish Boulder Creek Enclosed End Table with Drawer and Door offers storage in the form of a fully extending drawer and door with inlay. Bowed legs, gentle arches and ebony inlays give it character. Other features include a one-inch-thick top and soft close door hinges. Shown in Quarter Sawn White Oak with Golden Brown Stain. Shown in Quarter Sawn White Oak with Golden Brown. Our Dutchcrafters furniture has arrived and I just want you to know we are overwhelmed with it’s beauty. It’s such quality furniture! If there is a way for you to forward this message to the craftsmen please do. We couldn't have asked for anything more beautiful!